Irish or not, there is an universal excitement in the air on March 17th: young girls pick out shiny green ribbons for their hair, mothers rise early to make Irish oats, many of us brew a Bewley’s cuppa before heading out to work and every Irish pub opens its doors early and closes them late to accommodate the revelers. So, how do you celebrate St. Patrick’s Day? Sharing food and drink with a table of family and friends I hope! My contribution to this holiday celebration is the Irish Soda Bread. I wish I could remember where I first found this recipe, but as I have claimed it for three decades, let’s just call it mine. Many people are surprised to find caraway seeds in this bread, but in my household, this is a welcome taste. I also use currants instead of raisins, but again that is according to my family’s taste. Preheat oven to 375. Sift the first five ingredients together. Cut in the softened butter until the batter looks like small peas. Add currants and caraway seeds. Add milk all at once, and stir until mixed well. Knead a bit, and shape into a round loaf. Place on a greased cookie sheet. Cut a cross in the middle of the loaf. Bake for 30 minutes or until cooked through. Recipe makes one loaf. The one beverage needed at the table, Guinness, dark and hearty, will complete your St. Paddy’s celebration perfectly. Erin Go Bragh!!! **This post is dedicated to the memory of my maternal grandmother, Marjorie Buckley McAllister, herself a wonderful Irish woman, an inspiration to all who knew her and a St. Paddy’s Day baby! 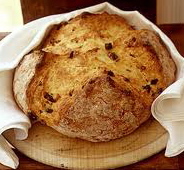 I may make a loaf of this this afternoon to take to a Ceileigh (pronounced Kay Lee) tonight ~ a kitchen party (potluck) with an Irish Fiddler! I made a loaf ~> YUMMY! Oh my, that was fast!! I am delighted, and very pleased you liked it too. Certainly is a family favorite here!